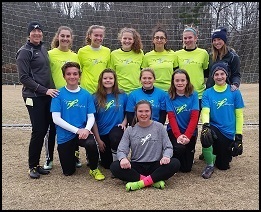 We just completed the Carolina Winter Camp in Pittsboro, NC last weekend, the first of three 2017/18 Dynasty Winter Camps. It was a great weekend of training full of saves and lots of smiles! Next up is Atlanta on January 20-21, 2018 (a few spots still remain open!) and we will wrap up on March 3-4, 2018 in Sparks, NV. Both camps are open to male and female goalkeepers while the Nevada camp offers both a YOUNG GK Clinic (ages 10-14) and an ELITE GK Camp for more experienced older goalkeepers ages 14+. The YOUNG GK Clinic consists of two 2 hour training session (one each morning) creating a fun and competitive environment focused on developing a sound technical foundation for young developing goalkeepers while fostering a passion for the position. The ELITE GK Camp will consist of two training sessions (4.5 hours total/day) a day (4 total sessions) with a lunch/lecture in between to discuss tactical aspects of the position and cover the essentials of sound nutrition for athletes. Plan for weekend of fun and intense training at the Golden Eagle Sports Complex in Sparks, NV and maybe even some snow?!? All camps are limited in size to 12-15 students to guarantee plenty of training and individual attention for each goalkeeper, so don’t delay registering if you are considering attending. If you are interested in registering please click on the banner above and/or call Tracy at 919-942-2903 if you have any questions. Brown recorded 10 saves against 31 shots faced in 209:54 minutes of work, as the Mustangs posted a 1-0-1 mark on the first road trip of the year to remain undefeated. In a 1-1 draw at Gonzaga, the Sacramento, Calif., native recorded nine saves against 21 shots faced. The junior followed up the strong performance with one save in 10 shots faced in the 2-1 overtime win at Washington. This is her first career player of the week honor. Played in 23 matches and recorded 23 starts. Finished the year with a record of 15-5-3. Third on the team in minutes played with 2,057. Chandler recorded nine solo shutouts and played in four combined shutouts. Ended the year with a goals-against average of 0.79, a save percentage of .739, and 51 saves in 2057:00 of action. Won five-straight matches during the Big Ten Tournament and the NCAA Tournament (11/3-19). Danielsen started 15 games in goal for the Violets. The Coral Springs, FL, native earned seven shutouts and finished with the third highest single-season save percentage (.867) in program history. Following a nine save, two shutout weekend, Kansas senior goalkeeper Maddie Dobyns garnered a pair of weekly honors for her efforts. The Big 12 Conference named her its Defensive Player of the Week, while Top Drawer Soccer added her to its ‘Team of the Week’, which highlights the top 11 players from the last week of collegiate soccer action. Dobyns, a native of Kansas City, Missouri, was key in the Jayhawks’ undefeated weekend as they topped Tulsa (2-0) and Oregon State (2-0), both on the road. She collected nine saves on the weekend, which included a six-save effort against the Beavers Sunday, as she and the Kansas defense posted a pair of shutouts. Dobyns’ biggest moment of the weekend came in the 68th minute against Oregon State, when she stopped a Beaver penalty kick attempt to preserve the Jayhawk lead. The senior has now gone more than 291 minutes since conceding an opponent goal. Started 19 of 19 games during the season posting a 10-8-1 record posting eight shutouts this season. Played 1750:04 minutes holding a 1.03 goals against average and a .811 save percentage. Made a season best 11 saves against Indiana (8/27/17). Broke the program record for career shutouts with her 27th after making five saves on the night in the 1-0 win over Wright State (8/24/17). Logged 1632 minutes and appeared in all 18 games as goalkeeper, while starting in 18. Achieved a career high of 8 saves against Northeastern. Gained 86 saves for the season and recorded a .796 save percentage. Established a shutout streak of 427:06 from August 27th through September 24th, the fourth-longest shutout streak in school history. Finished the season with seven shutouts. Knussman started 19 of Salisbury’s 20 matches this season and was the leader of the defensive unit. Seven of Knussman’s nine victories were earned by way of shutout, and she managed to hold CAC opponents to a low 0.33 goals against average. As a result of her consistency in net, Knussman was a three-time Defensive Player of the Week recipient in 2017. She finishes her career with the Sea Gulls having played in 44 matches with 40 starts, 20 wins, and 14 shutout wins. Played every minute in goal and finished the year with 96 saves, the second-most ever for an Indiana freshman. She ranked third in the conference in saves and her five shutouts are the most for an Indiana freshman since 2007. Had nine games with six saves or more and was named the Big Ten Freshman of the Week on Oct. 17 after posting a career-high 12 saves in Indiana’s 2-1 win against Iowa, which is the most in a single game for a Big Ten keeper all season. Ranked near the top nationally all season in goalkeeper minutes played and finished the year with 1795:24 minutes between the pipes. straight season. The goalkeeper from Douglasville, GA, lead the SEC and ranked eighth in the country with a 0.41 goals against average. She conceded just three goals in SEC play this year, and her 14 shutouts in 2017 are one shy of the program single-season individual record. Krzeczowski, is third in program history with 23 career shutouts, collected All-SEC honors for the second-straight year this season. The visual communications major and 2016-2017 SEC Academic Honor Roll selection sports a cumulative GPA of 3.47. Serving as a team captain for the Lady Toppers, Leone closed her career on The Hill as one of the top goalkeepers in program history. WKU Soccer’s all-time leader in Player of the Week awards with four, Leone was a two-time C-USA Goalkeeper of the Week selection this season on Sept. 25 and Oct. 16. The Kennesaw, GA, native ranks second all-time in solo shutouts (27, five in 2017) and career goals against average (0.98, 0.92 in 2017) and third in saves (297, 72 in 2017). Malham was a brick wall helping Ohio to a 2-0 weekend to start MAC play. In total, Malham played all 180:36 minutes in net, allowing one goal on 15 shots on goal faced and making 14 saves with one shutout. Redshirt freshman Kate McEachern earned her first ACC Defensive Player of the Week honors during her very first career starts posting back-to-back shutouts of Hofstra and Duquesne. The Pitt rookie from Troy, Michigan made six saves in the 1-0 win over the Pride and followed up with two saves in 100:42 of action in another 1-0 win over the Dukes. Proctor, a 2017 tri-captain, commanded a Blue Devil defense that posted a school record 18 shutouts in 2017 while finishing sixth nationally in goals against average (.379), seventh in shutout percentage (.692) and 33rd in save percentage (.841). Capped her career owning the all-time records for shutouts (35) and goals against average (0.65), as well as the single-season marks for clean sheets (14) and GAA (0.35). Tallied five shutouts in the 2017 NCAA Tournament, moving her career total in postseason play to nine to capture the school record. Also reached 50-career victories, becoming the second keeper in school history to reach the 50-win mark. Finished the year third nationally in shutouts, sixth in GAA and 21st in save percentage (.857), all which were tops amongst ACC players. Played 2077:24 minutes (2nd ACC, 8th NCAA), drawing 24 starts. Tallied four saves and did not allow a single goal over five contests in the 2017 NCAA Tournament, marking the first time in school history that Duke did not allow a goal in postseason play as the Blue Devils advanced to their fourth NCAA College Cup. Did not allow a goal against four Big 12 opponents, all ranked top 25, including three matches in NCAA Tournament action. Ryan, a two-time All-PBC selection, was dominant in net for the Black & Gold this season and led all PBC keepers in games played (21), minutes (1,857), goals against (11), goals against average (0.53), save percentage (.892) and shutouts (11). The sophomore ranked eighth in all of Division II in save percentage, 15th in minutes and 16th in goals against average. Ryan has logged 18 career shutouts in 32 games in which she has played from start to finish and sits fourth in the UNCP record book in career shutouts after just two seasons. Her career goals against average and save percentage currently rank first in program history as well. Appeared in 12 matches for the Highlanders with 11 starts. Tallied 51 saves with a .773 save percentage and compiled four shutouts with a 7-4 record. Served as a team captain and started all 20 matches in between the posts for the Green and White. Finished the season with a 7-12-1 record, setting a career-high in victories. Ranked third in the Mid-American Conference with a career-high 100 saves. Ranked tied for third in the league in saves per game (5.00). Faced a career-high 292 shots, the second-most in EMU history. Owned a 1.80 goals against average, while holding a .738 save percentage. Posted four shutouts, pushing her career total to 10. Faced a career-high 29 shots, tying a then-career-high with 10 saves, in a 3-0 win over Western Michigan. Started 19 matches in goal, missed three due to injury. Lowered her GAA to .88, a career best. Ranks sixth in the program’s all-time record book for single season GAA and fifth all-time for career GAA. Posted a career-best .790 save percentage. Recorded eight shutouts on the year to rank fifth in the ACC. Played 1,735 minutes and made 64 saves to rank fifth in the ACC. Finished the season with 12-5-2 record. Made a season-high eight saves against Princeton in the NCAA Second Round. Named ACC Defensive Player of the Week on Sept. 19 after recording a combined 10 saves in a 0-0 2OT draw with No. 3 Virginia and 1-0 win vs. Western Carolina. Angelina continues to excel and impress at the U17 US Women’s National Team level. Since joining the pool in May 2017 she has been called back into every subsequent camp! She ended 2017 participating in the last 2 camps with the U17’s traveling to Mexico for 2 games and training in Florida concluding with 2 games against Haiti. She started 2018 right where she left off in camp in Florida again this time with 2 matches against Venezuela. The matches serve as excellent preparation ahead of the 2018 CONCACAF U-17 Women’s Championship. That tournament will be held in Nicaragua next spring and will qualify three teams for the 2018 FIFA U-17 Women’s World Cup in Uruguay.